A person would be inclined to think that a city as chic and seemingly immaculate as San Luis Obispo would not put up with littering of any kind, but on the same street where a cup of coffee will set you back 7 dollars, and the purchase of a genuine porcelain Dalmatian is a cool 10 grand, Bubblegum Alley is not only unhygienic, it’s celebrated. Of course for some, it is not enough to chew and stick. Many of the wall’s contributors have spelled out declarations of love in this viscous substance. If a gentleman can’t capture his lady’s soul with a well-formed and pre-chewed heart with their initials inside, he ought to take the hint and realize this love was never meant to be. Others have taken the opportunity to use the well-traveled walkway as advertising for their professional trade. Who amongst us would not want their carpet steamed and cleaned by the guy who affixes his business card in an alley with a few strategically placed pieces of Dentine? 4 out of 5 dentists use him… why not you? 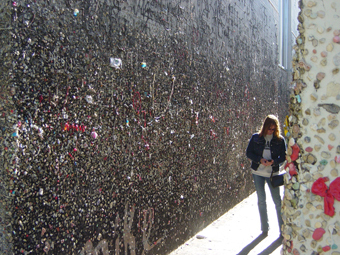 If this following warning is needed at all, please refrain from peeling the gum from the wall and chewing yourself. 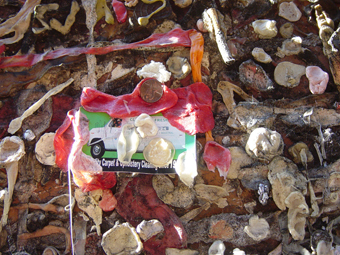 Even in this well-heeled area, gum is still available at a reasonable price, and perhaps more importantly every now and then you will run across a condom (which can look like gum if you’re not paying close attention) that is somehow glued to the wall. The old axiom of better safe than sorry is well applied here. Should you ever find yourself on Higuera Street just north of Broad, chew some gum and walk down the passageway at the same time. It’s Bubblicious. –Joe O.